The Official 2019 Show Truck Model! NOT IN STOCK - PRE-SALE ONLY! Order BEFORE June 14, 2019 at the PRE-ORDER price of $85! 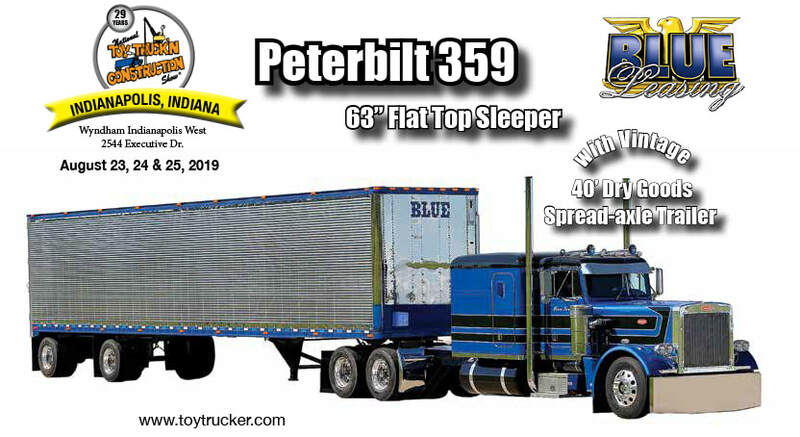 ​The Blue Leasing Peterbilt 359, 2019 NTT'NS model in 1:64 scale. Announcing the Official 2017 Show Truck Model! LeFebvre & Sons, Inc. Kenworth T880 with Heil Trailer in 1/64 scale. Since 1928, the LeFebvre Companies, Inc. have been in the transportation service industry. A key to their ongoing success is the reliable relationships they make with their customers. This is done by consistently delivering products safely, on time and at competitive prices. This model of hard work and partenership has served them well, creating lasting relationships, some 89 years strong. As the industry and needs of today shift and grow, it is their intention to continue to provide new services and expand their offerings. For years, pneumatic bulk hauling has been part of the LeFebvre Companies. Today, LeFebvre Bulk Transport is operated by the 4th generation of the LeFebvre family, Mitch LeFebvre. After all this isn't just a business, it's a family. Fonatine® has become an industry leader. Sine its beginning in 1940, Fontaine's customers have helped developed them into the largest platform trailer manufacturer in the world. The Fontaine® Renegade LXT40 Trailer includes the following features, extendable deck, removable outriggers, and a detachable gooseneck. The Official 2015 Show Truck Model. The Miller’s Century 9055 Towing unit has: functioning boom (extends and raises); functioning stability Jacks; and functioning underlift. Lowell Davis' appealing style of rural art has charmed collectors worldwide for over 20 year. His 60-acre FoxFire Farm, outside Carthage, Missouri, serves as the main inspiration for his art which captures the warmth and gentle humor of a time gone by. 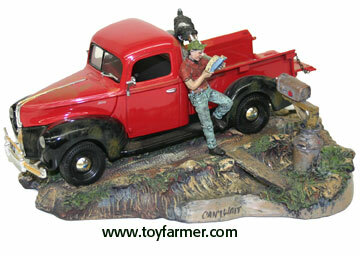 A painter and a sculptor, Lowell is best known for his collectible figurines depicting country life. The popularity of his work is testimony to the values that people still hold dear. This detailed piece is 8 1/2" x 7" and 4" high. Start your collection today with the #1 truck in the "The Trucking Pioneers" series with the Crouse Cartage Company International Transtar II with Classic Tractor. The Toy Trucker Series of Classic Tractor-Trailers raises the standard for high detail in classic 1:64 scale die-cast metal collectibles. This replica utilizes state-of-the-art manufacturing processes to replicate all the features of a classic over-the-road truck. In Stock! Only 500 were produced. ﻿Limited Quantities - ORDER NOW! Continue your collection with the #3 truck in the "The Trucking Pioneers" series with the H&W Motor Freight International Transtar II with Classic Trailer. Continue your collection with the #4 truck in the "The Trucking Pioneers" series with the #4 Johnson Motor Lines, Inc. International Transtar II with Classic Trailer.